This room sleeps 6. It has a private bedroom with a king bed. 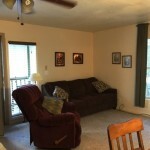 The main living area has a queen bed and a queen sofa sleeper. 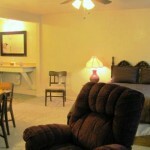 The room has cable TV, fridge, microwave, toaster, and coffee pot. 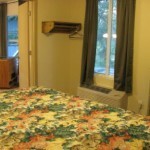 The private bedroom has a king size bed and its own a/c and heat unit. 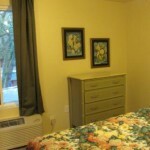 There is a small closet and a dresser to help make an extended stay more comfortable. The outside porch area has a private seating area just for this room. The Kitchenette has a mini-fridge, microwave, toaster and coffee pot. We even provide the coffee! 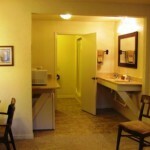 The bathroom has a large walk in shower and double sinks. Shampoo, lotion, and bar soap are provided along with all the bed and bath linens. Queen bed in main living area.